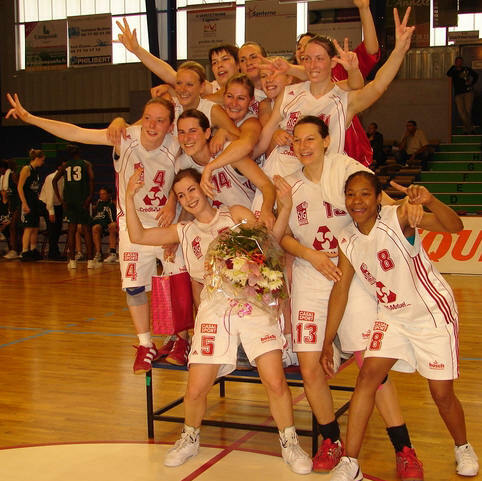 The SIG added to their Tropheé Coupe de France success the NF2 title. In the final they beat US Laveyron (72-57). The first period was a tight affair with the SIG coming out on top (22-17). During the second period however they stepped on the accelerator and increased their advantage (32-20) with 16 minutes on the game clock. Yet after the SIG lost Céline Schmitt-Sendner due to an accidental clash of heads they saw their lead reduced to 9 points (36-27) by the interval. Caroline Nestor-Deininger got off quickly at the start of the second half of the match with a trey. Then SIG took complete control and by the time Schmitt-Sender returned with six stitches, Laveyron looked beaten. Nestor led the scoring with 26 points. But it was the defence of the SIG that did the damage as they conceded only 57 points. No luck for the USVO Espoir as they finished fourth like last year. They were beaten by Ifs (74-60) in the third place match. As a result of the SIG wining the championship, Nice CAB have been offered the final promotion place into NF1. Ifs will decide after their annual general meeting if they accept promotion. Nice will also make a decision on their participation in NF1 also. 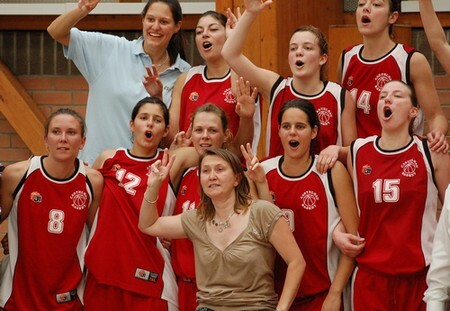 Castelnau Basket ended their season on a high with an overtime victory against USM Saran (81-75) to lift the NF3 crown. Last season Flore Perotto was wearing the colours of Lattes-Montpellier and playing in the LFB. She was considered surplus to the requirements at Montpellier and so she decided to step down and play in the lower leagues. Her experience in tricky situations helped Castelnau to win this game. With only seven minutes left of the regular time Saran looked to have the game won (61-41). Castelnau's head coach Florence Garnier then picked up her second technical of the match and had to leave the court after a hot discussion with the officials. Before her expulsion her side had reduced the deficit (47-64). Saran then fell apart. It all started with a little bit of undisciplined behaviour which resulted in a player picking up a fifth foul and then talked herself into a technical that allowed Perotto 4 free-throws which she converted. She then hit what could be said to be the knock-out blow on the very next possession with a trey. Julie Mason gave Perotto a hand by scoring 4 points before Perotto hit another three-pointer. At that moment Saran's lead was cut to 2 points with just less than one minute left in the game. Then with 20 seconds left in regulation time the game was tied. Saran messed up the last play and the game went into overtime. Mason gave Castelnau the lead during overtime which they did not lose and went on to win (81-75).